Like the city of Rome, Providence is surrounded by seven hills but the two best known are Federal Hill and College Hill, which is where you’ll find some of the city’s best restaurants. 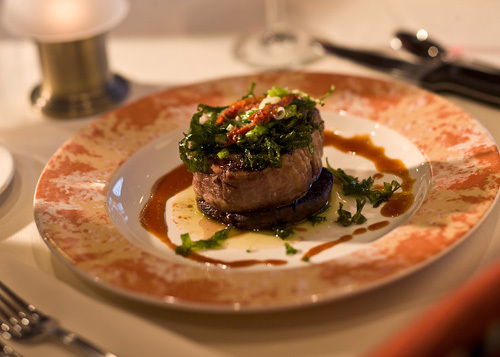 On Federal Hill the Cassarino’s on Atwells Ave is a favorite Italian bistro featuring authentic Tuscan cuisine in a warm and lively atmosphere. Another favorite of ours is Hemenway’s Seafood Grill on College hill which features creative Mediterranean cuisine, homemade pastas, breads and tapas. Also on College hill is Mill’s Tavern, an american and french restaurant featuring upscale seafood and wood grilled dishes set in a warm colonial tavern atmosphere. So come stay with us at the Christopher Dodge House, a wonderful and charming alternative to conventional Providence hotels, and let us make your dinner reservations at some of the best cuisine Providence has to offer. This entry was posted in Uncategorized and tagged Food and Beverage by admin. Bookmark the permalink.